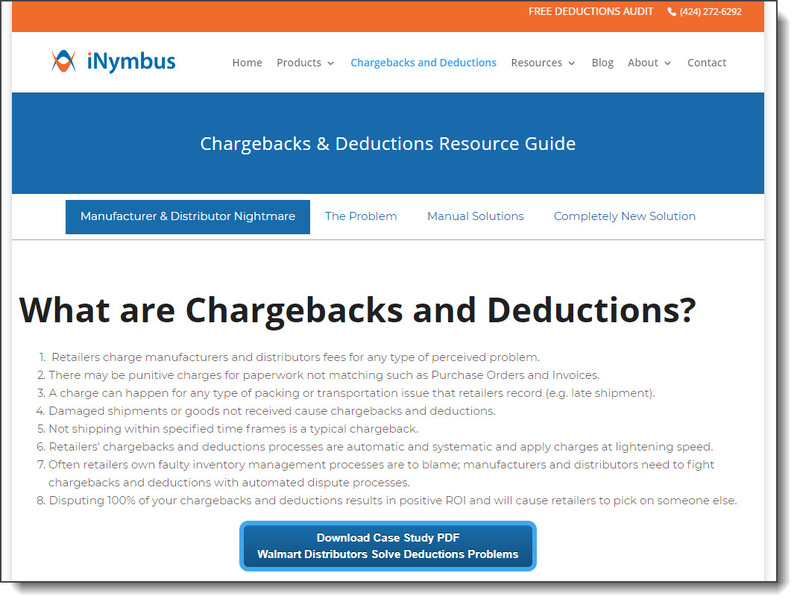 iNymbus is a SaaS (software as a service) startup that helps consumer product goods manufacturers and distributors attack the ever-increasing problem of retailer and shipper deductions and chargebacks. 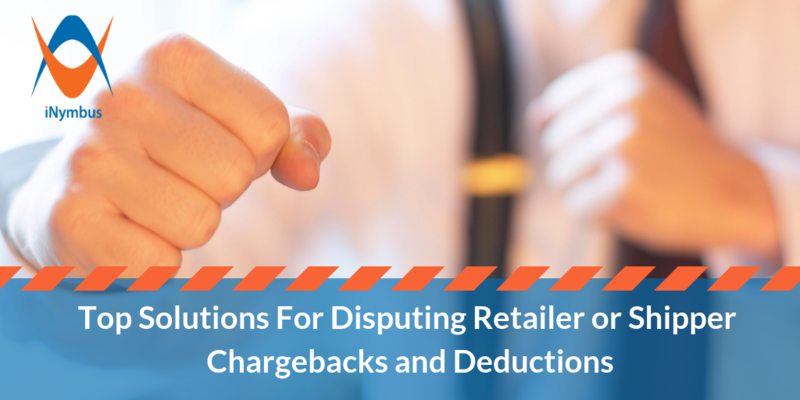 Processing these chargebacks and deductions from Target, Amazon, Walmart and Costco, to name a few, for iNymbus customers is an entirely manual process where the retailer portals change constantly, and overnight without warning. iNymbus software resolves and disputes deductions and chargebacks automatically utilizing cloud robotic automation and artificial intelligence to upload denied claim packets to retail vendor portals and submit disputes on the customer’s behalf. All sales efforts were outbound cold calling and email blasts. Unfortunately, iNymbus had run out of people to call. And their mass emailing had become ineffective. Their solution relied on cloud robotic automation which is a technology concept foreign to their Finance targets and not necessarily the “safe” solution (like outsourcing and accounts receivable software packages). 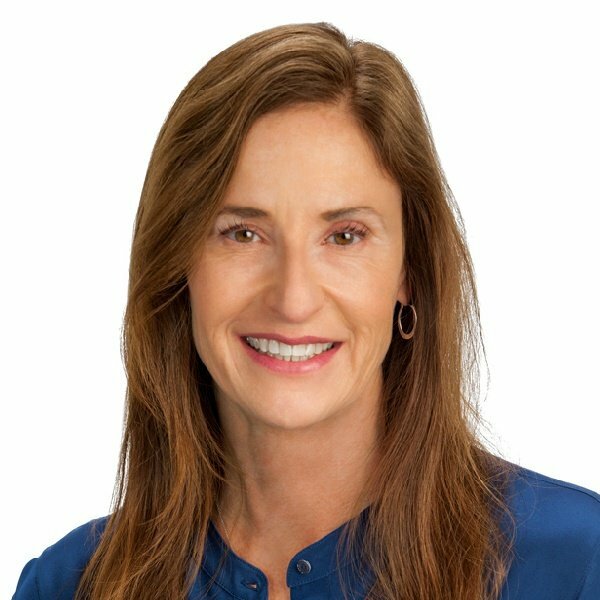 Large accounts receivable package software companies professed to offer solutions, but in fact only offered bandaids, further complicating the sale and confusing the prospects. In big companies where the iNymbus solution could be have very high ROI, the sales cycle began to resemble a 12-18 month enterprise sale, with IT team members involved as well as Procurement, and Finance. And the iNymbus Finance Prospect was a cost center, without budget for new systems. Essentially, in a nutshell, iNymbus needed sales leads, and they needed them fast! At this point, the iNymbus Founder and Chief Engineer began considering that it might be time to invest in Marketing. Orange Marketing’s initial solution for iNymbus began with a foundation of content. We quickly realized that the business problem needed a thorough explanation as to the problem iNymbus solved, why it was a problem, why traditional solutions would never work, and how iNymbus was different, easy and safe. We also needed to ensure iNymbus was ready for inbound including very targeted email. Our smart founder and his team of executives needed education around the techniques of inbound, and why we were confidant content production (both white papers and case studies) as well as social media, email and the like would work over time, and educate the prospect in their own timeframe. It was also critical that we establish with iNymbus their buyer personas, and develop a proper path for them through the content and the conversion funnel. We knew that the needs of an Accounts Receivable Clerk would be very different than a CFO or an Information Technology professional. We needed to have agreement from the iNymbus Sales Director as to what constitutes a true Marketing Qualified Lead, how they would receive it as well as how they would process it and notify Marketing that the Lead was not qualified. Using a Deal Board was key to transparency between Sales, Marketing and our Founder. The world of Accounts Receivable is small. It is a specialty within a specialty. We worked with iNymbus to explore potential trade organizations who could get iNymbus in front of key prospects. We helped iNymbus take advantage of white paper publication opportunities as well as webinars & tradeshows. We firmly believe in advertising to kick start the inbound process. iNymbus was so new, there was absolutely no website traffic to speak of. With small B2B niche SaaS clients the targets are out there (although it takes some experimentation to find) and will pay off with advertising conversions in the nichey B2B space. The iNymbus website was hosted on WordPress and had been custom coded. Updating and adding content required working with a third party overseas developer. We recommended moving the site over to HubSpot so we could quickly add content to the iNymbus website and also optimize for conversions. Nurture Email Campaign pushing content over time, for education. Email - Multiple email campaigns marketing events and premium content, as well as making very good use of the the weekly newsletter format (blog email). Advertising implemented on Google Adwords, as well as Linkedin, Facebook and even Twitter. Event specific promotion on social media, via trade partners, and using email. Public Relations - We looked at any white paper content or trade show as an opportunity for a press release via PRWeb and a chance to get the iNymbus out there, as well as increase legitimacy with prospects. Lead Pop Ups - Serve content specific lead popups as prospects are browsing the site, to get them further investigating solving their problems using iNymbus technology. The iNymbus website was converted to HubSpot enabling quicker updates with content conversion opportunities. The move to AWS (underlying HubSpot hosting) also caused the website to substantially increase in speed, helping their SEO. Our iNymbus Founder was extremely focused on MQLs (Marketing Qualified Leads), turning to SQLs (Sales Qualified Leads). Monthly marketing metrics reporting were a critical part of our process. Traffic Increased 200% vs. pre-Marketing period and with traffic variety across the various channels. 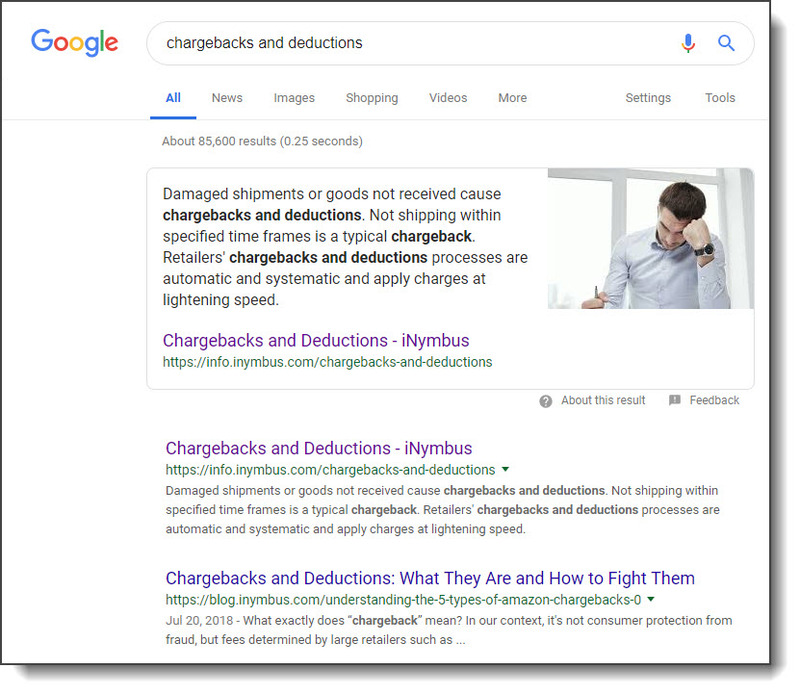 We nabbed the featured snippet on Google for our client's critical keywords "chargebacks and deductions" and also search listings #1 and #2 for "chargebacks and deductions." Our pillar page did the trick! New Contracts increased 250% and showed variety across the various channels. MQLs created went up 300%! Traffic from Organic Search - Increased 55%. Results Tied to Revenue: Three Customer Closed Deals are tied to MQLs. We know Marketing efforts have influenced decision makers and deals and two came in through organic search. Our work to increase MQLs (Marketing Qualified Leads) has created an influx of opportunities to iNymbus Sales. In the next phase of our relationship we are working towards converting the MQLs to SQLs (Sales Qualified Leads). Orange Marketing has contracted with a Sales Development Rep in order to assist iNymbus Direct Sales, by calling through the leads, qualifying and creating SQLs. This was an opportunity for improvement both the Founder and Orange Marketing discovered after we realized the Direct Sales Team did not have time to deal with 100% of the new MQLs, plus attend to the hard work of enterprise sales with the existing qualified SQLs. The new SDR started just last week, and we are very excited to see MQLs, turn to SQLs, and close deals. We see more opportunities to engage in social media as we have discovered some unique supplier Walmart and Amazon FaceBook Support Groups where iNymbus could provide helpful advice. We also are finally ready to attack the iNymbus website now that we have our foundational marketing elements in place. We will use a HubSpot template pack to enhance the site and build in even more Prospect education. Finally 2019 will see an increase in trade organization participation as we have uncovered some interesting Supplier Trade Support opportunities around Walmart. Getting our iNymbus content syndicated with Supplier Trade Groups is critical to our SEO strategy and results. With iNymbus, similar to all our B2B SaaS startup clients, we have found that we cannot leave any rock unturned: educational content, case studies, webinars, trade shows, paid advertising, social and content syndication all play roles in creating MQLs. 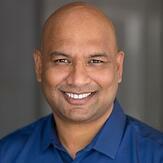 Says our iNymbus Founder and CEO, Sreedhar Narahari: Website Traffic Doubled!